Happy Friday everyone! For this week's French beauty post, I have tested Yves Saint Laurent's newest primer that the brand launched a few weeks ago, Touche Eclat Blur Primer. YSL is developing their Touche Eclat franchise, named after the cult illuminating pen. After the foundation, the range is now being widened to include the Blur Perfector (a pore minimizing, smoothing balm-to-powder to use on top of makeup) and the Blur Primer I'll show you today. I'm testing it from a sample - not a deluxe sample but one that was made for me at a store in a tiny plastic jar, so I won't be able to comment on the packaging for you. It looks similar to the glass pump bottle of the Touche Eclat Foundation, which performs perfectly well. "Touche Elcat Blur Primer preps skin for foundation application, creating an improved, refined appearance: pores seem to be minimized, skin texture feels smoother, and skintone is more even. It’s enriched with four nourishing oils—corn oil, apricot kernel oil, passiflora oil, and rice bran oil—to leave skin feeling incredibly soft without a greasy residue. Packed with blur technology, this universal primer provides a subtle, golden shimmer for ultimate luminosity". Cyclopentasiloxane, Dimethicone Crosspolymer, Fragrance, Zea Mays Oil/Corn Oil, Prunus Armeniaca, Kernel Oil/Apricot Kernel Oil, Passiflora Edulis Oil/Passiflora Edulis Seed Oil, Oryza Sativa Bran Oil/Rice Bran Oil, Calcium Sodium Borosilicate, Silica, Tin Oxide, [+/- May Contain, Ci 77891/Titanium Dioxide, Ci 77491/Iron Oxides]. One thing you may notice here is that it contains a ton of fragrance (3rd ingredient). While it does smell nice, with a fairly strong white flower scent, this high amount of fragrance could make it problematic for sensitive skins. 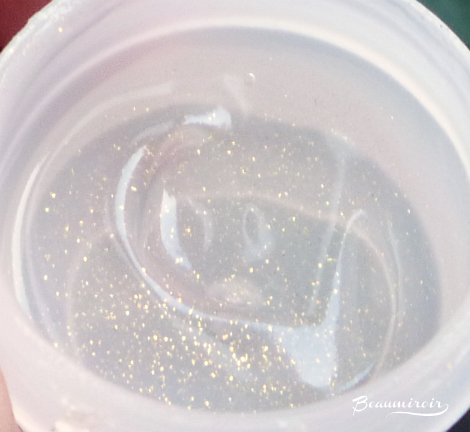 Touche Eclat Blur Primer is a clear gel with tiny flakes of golden shimmer. The particles reflect the light and the general aspect of the primer is really fascinating! Once spread on my skin, the shimmer is hard to detect unless I'm in full sun or under a bright light. If you're afraid that the sparkles might turn you into a disco-ball, don't be, they're discreet enough to yield a subtle effect. For me, the Touche Eclat Blur Primer feels a little different from your typical silicone primer. Maybe it's due to the presence of the plant oils, but I feel like it's a little more wet and slippery. I would even say that it feels slightly oily to the touch, although it doesn't look oily at all: once spread and set it looks almost matte, with just a very subtle, natural sheen, and the luminosity brought by the shimmer. There is also no greasy sensation left once it has set (YSL does suggest to wait 10 seconds before applying foundation). So does it live up to the brand claims? 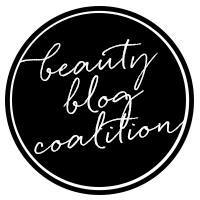 "Pores seem to be minimized": that is absolutely true! I have large pores on my cheeks, close to my nose, and they're clearly less visible after applying the Blur Primer. 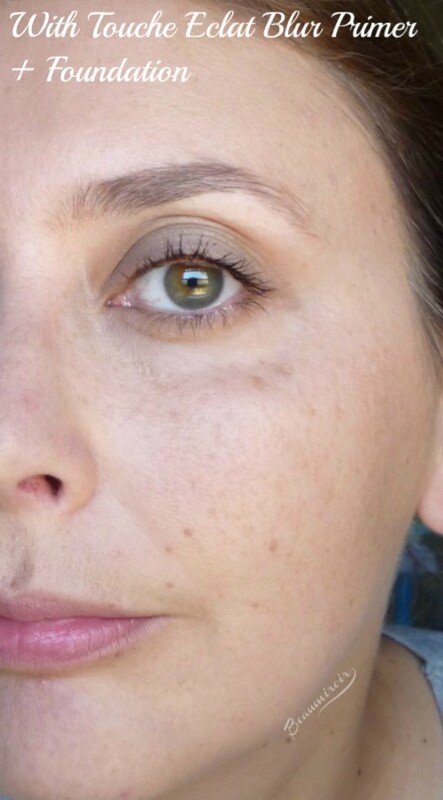 With primer + foundation, they become hard to spot! On the other hand, it didn't really fill the lines around my mouth as well as some other primers I've tried. "Skin texture feels smoother": true, it's a silicone primer after all! Skin feels softer and very smooth. I can't say that it helped apply my foundation more easily though, I still had to buff to avoid streaks and get perfectly even coverage. Some silicone primers make your foundation glide like a dream, I didn't feel like it was the case with this one. "Skintone is more even": I beg to disagree. This primer being a clear gel, it doesn't provide any coverage or color correction. 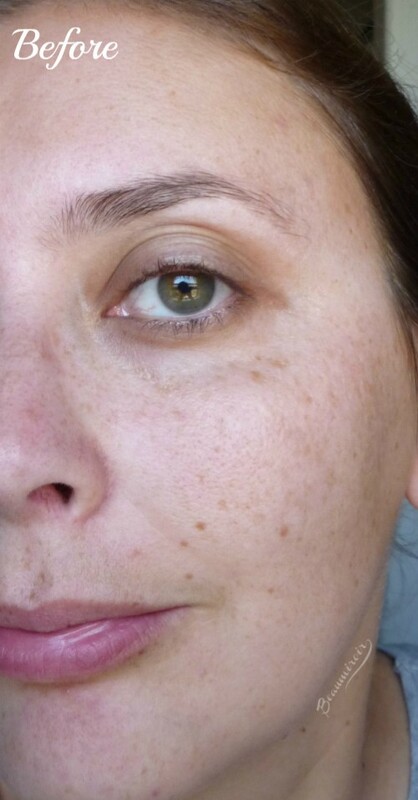 The texture of my skin looks more even, but it doesn't do anything to blur the redness or sunspots. "Ultimate luminosity": yes, I think it does make my skin more luminous. It adds a bit of radiance to my bare skin, and in conjunction with the Touche Eclat Foundation, it creates a beautiful, very luminous base. Look at the before/after pics. doesn't my skin look natural yet super radiant? YSL doesn't talk about Blur Primer extending the wear of foundation applied on top, but I think it does help a bit. 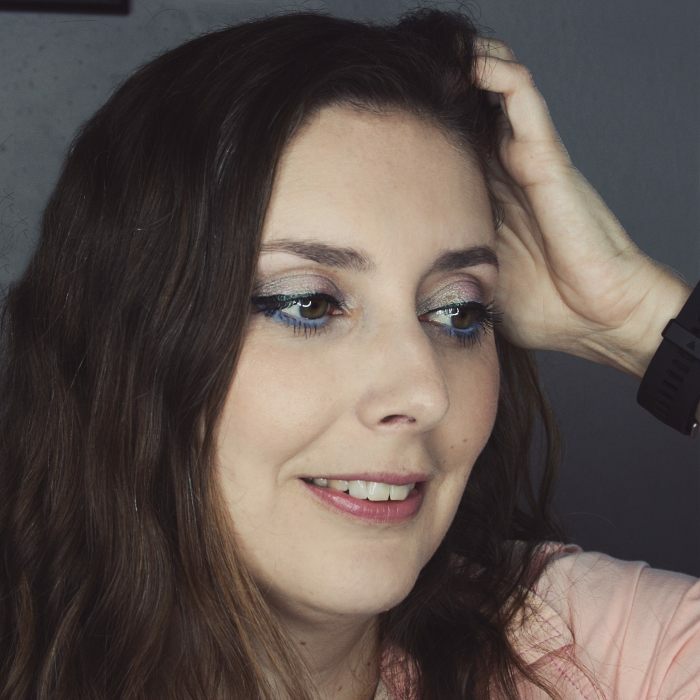 I've been testing it on really hot days, and while I had to reapply mattifying powder throughout the day, the Touche Eclat Foundation resisted a bit better than it does when I use it by itself. Note: I layered mattifying powder on top of the Touche Eclat foundation. I always do because its finish is a bit too dewy for my taste. Overall: Touche Eclat Blur Primer is a good, although pricey, option if you want a primer that blurs your pores and boosts luminosity. 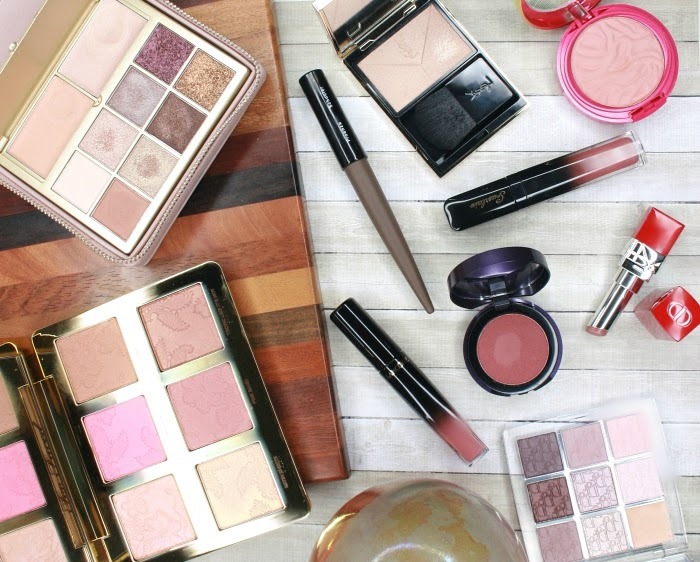 If you also like pretty, luxurious things that sparkle, you should definitely give it a try! I received a sample of the product featured in this review in a store - you can too, just ask a sales associate. I received no compensation to write this post, which only reflects my personal opinion. This post contains affiliate links.